I am on a train underground with what feels like several hundred people, or maybe a thousand. A few of my friends with me are dressed in their lederhosen and dirndls, the traditional dress of Bavaria, and a few of us are in regular street clothes. We are heading through the underground station to a set of escalators. Our destination is the Oktoberfest on a trip that I have been planning for six months. The anticipation and excitement are building just riding up that escalator and I feel like a kid again going to an amusement park for the first time. The top of the escalator opens up to a sunny day in Munich and the Oktoberfest crowd streaming into the Theresienwiese, a huge fairgrounds just southwest of the city’s old town center. After getting my bearings the first thing I saw and smelled was roasting fish. Walking down the side thoroughfare we came upon rows and rows of stekerlfisch. This Bavarian specialty is a whole fish skewered on a stick roasted over a long line of hot wood coals. Rounding the corner, I see the main tents with bright colors and huge cartoonish icons. One has a mechanical ox slowly turning on a spit above the entryway, and another has a tower capped with a giant beer stein. The size of the structures makes them appear less like a tent and more like a temporary building. My group has reservations at the Hippodrom, known for attracting celebrities. It’s a fall day that is the perfect temperature in the sunshine to just wear a long-sleeved shirt, but inside the rosy red and yellow glow from the swaths of cloth draping the inside of the tent roof bathe the entire place in warmth making this large space seem somehow cozy. We are taken to our tables by the host staff dressed in traditional Bavarian clothes but wearing wireless radio headsets and carrying clipboards. This is like getting into the cool club in town, except instead of techno music there is a German pop band playing oom-pah fused with eighties rock. As the party starts we order beer in one liter mugs called a masskrug and some of the most delicious food I’ve ever tasted. Normal fare at the Oktoberfest includes dishes like roasted chicken or duck, sausages of all types, hearty beef or game dishes in a savory gravy, and for the adventurous, the schweinhaxe. This roast pork knuckle is a large portion of meat that tastes like a big piece of bacon. Every 15 minutes the band plays a round of the song “Ein Prosit” which translates to “A Toast”, and the entire crowd stands up and sings along holding their heavy mugs high and clinking them together heartily. This is a party on a mass scale, because every day for two weeks a dozen tents like this will be repeating the celebration from morning til night. Drinking several liters in several hours, can really make you need a walk and so after several hours we went to tour the rest of the Oktoberfest. Colors are everywhere, but especially things splashed with the blue and white colors of the Bavarian flag. Rows of vendor stalls selling everything from designer cookies, to souvenir mugs stretch from the entrance to the great statue of Bavaria. It looks like it must be here all year long, and not at all like the carnival vendors in trailers you might find at an American county fair. The midway of rides however, looks very much like what you might find at a fair but bigger; much, much bigger. The rides all have thousands of sparkling lights and thumping techno and rock music. Kids and brave adults (some who have maybe lowered their inhibitions with too much beer) wait in lines ready to see the world spinning upside-down from one hundred feet high. On our way out came the last temptation, in the form of a doughnut. After we had walked off our dinner, and had our last beers in the tents, we passed by the irresistible cream and jelly filled berliners. These specialty doughnuts are made fresh from the vendor. How about an espresso with that? Don’t mind if I do. I’ll need just that bit of sugar and caffeine kick to get me back on the train to navigate my way to the hotel to sleep off my happy day at the Oktoberfest…. well, maybe after a little shot of schnapps from the hotel bar. 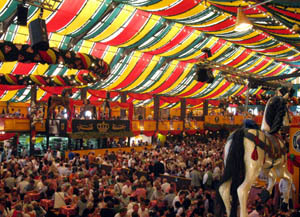 The Oktoberfest is a fun destination vacation for your travels. Not only is it popular and fun, but it is not that hard to plan. I’m currently planning my third trip and I will be talking about it in one of my podcast episodes, so stay tuned to this blog and the podcast.